Camera provided a history of photographic cameras, and The Art of Sound: A Visual History for Audiophiles (published by Thames & Hudson earlier this year) is the equivalent for recorded sound. 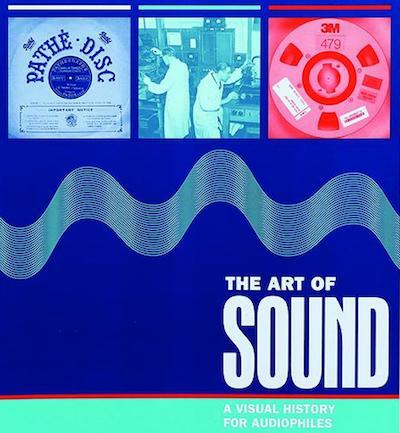 Author Terry Burrows divides the history of sound recording into four broad eras (acoustic, electrical, magnetic, and digital), from the phonautograph (the first machine capable of recording sound waves) to the MP3 (the most common digital compression format). Each era is illustrated with photographs of recording and playback equipment from the EMI Archive Trust, along with blueprints and record sleeves. The examples of audio equipment include devices using a stylus to reproduce sound from grooved cylinders or discs (the phonograph, graphophone, and gramophone), magnetic wire and tape recorders (the telegraphone, reel-to-reel recorders, eight-tracks, and cassette players), and digital storage media (CD, DAT, DCC, and MiniDisc). Most fascinating are miniature gadgets such as the Mikiphone and Minifon, and novelty items like the Stollwerck gramophone that plays schokoladedisken (chocolate records). Each chapter begins with an essay outlining the technical developments in sound recording (such as stereophonic sound, Dolby noise reduction, and peer-to-peer file transfer), and their cultural impact. The book also profiles innovators of audio technology, including Thomas Edison (inventor of the phonograph), Guglielmo Marconi (radio pioneer), and Valdemar Poulsen (inventor of magnetic recording). However, some iconic brands and designs - such as Ekco radios, Nagra reel-to-reel recorders, and Braun hi-fi units - are missing, and there is no bibliography.